More rigid, more accurate, easier to use, these are the main words of this new version developed on the MakerFr forum! Even though it looks like its big sister “R-CNC”, everything has been redesigned and optimized. 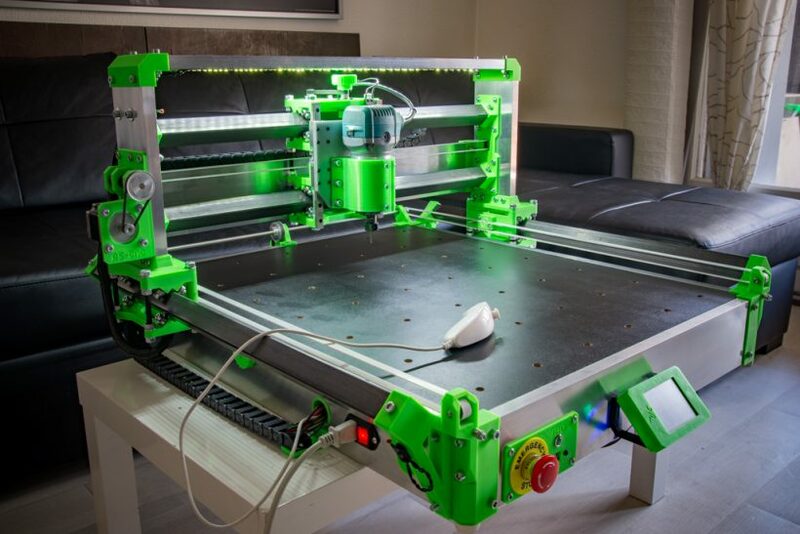 I am really interested in making one of these, Is it an easy thing to modify the length of X would ideally like a bed size of 1mtr x .75mtr i.e. 1 sheet of depron. Buon giorno , io vorrei comprare da te direttamente la rs cnc … è possibile? Hello! Congrats on the great design and most of all thanks for providing the documentation for free. I was gonna build an MPCNC but as soon as I saw this project on youtube I was sold. 1) In my country I can’t find the box screed required, so I’m wondering if I can use rectangular 100×30 box section (easily available) as a replacement. From what I gather it doesn’t bear much load, but I don’t really want to use wood because of warping. Do you thik the extra thickness would compromise, for example, the fitting of the Y rails? 2) I’m also thinking about adding a small laser module, for low-power engraving tasks, perhaps in custom bracket on the side of the spindle. Any thoughts regarding this? This is a brilliant project and I’m half way through and it’s going well. Can you tell me what you coated the MDF table with? It looks good in your pics although I guess it has to be fairly hard wearing. I coated the MDF table with black paint for wood. Bonjour, quelle est la taille maxi qu’on pourrait envisager sur cette CNC. Mes projets nécessitent que je puisse travailler des paneaux finis d’environ 180 sur 70, est envisageable de monter un châssis de 200×90 par exemple ? Pour moi 2m c’est vraiment trop long ! j’ai chez moi une Anet A8 que je pensais transformer en graveuse laser, mais en voyant ta RS/CNC (que je vais faire 😉 ) je me suis dit que cela surement mieux intégrer à celle ci : plus grande, plus tout quoi … pense tu que cela est ce possible ? y as tu déjà pensé ? After a 4 month long investigation into MP-CNC I believe that the RS-CNC just might be what I’m looking for. I was wondering if any other modification concerning the Hardware and software could be envisioned to boost the speed of the RS-CNC. Why would you boost the speed ? You used wood in the video. But the material I want to use is cast iron. What is the performance of the cast iron processing on this device? If you need iron milling, you have to get a professional CNC milling machine who is build with massive metal. RS-CNC can mill wood, carbon, aluminium but not iron.